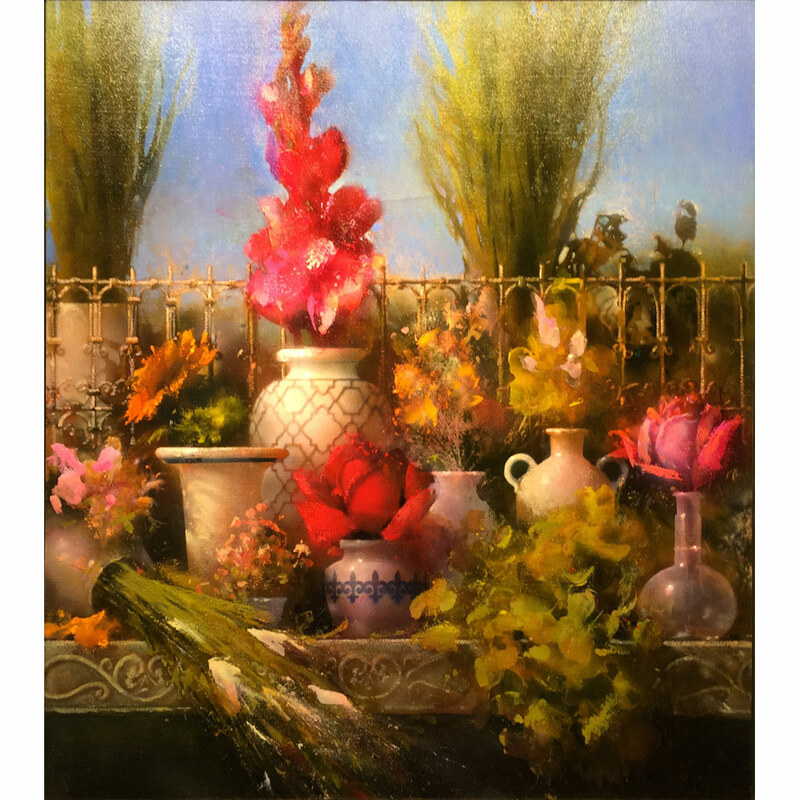 David Dornan resides in Utah and has spent the past nine winters painting in the desert. 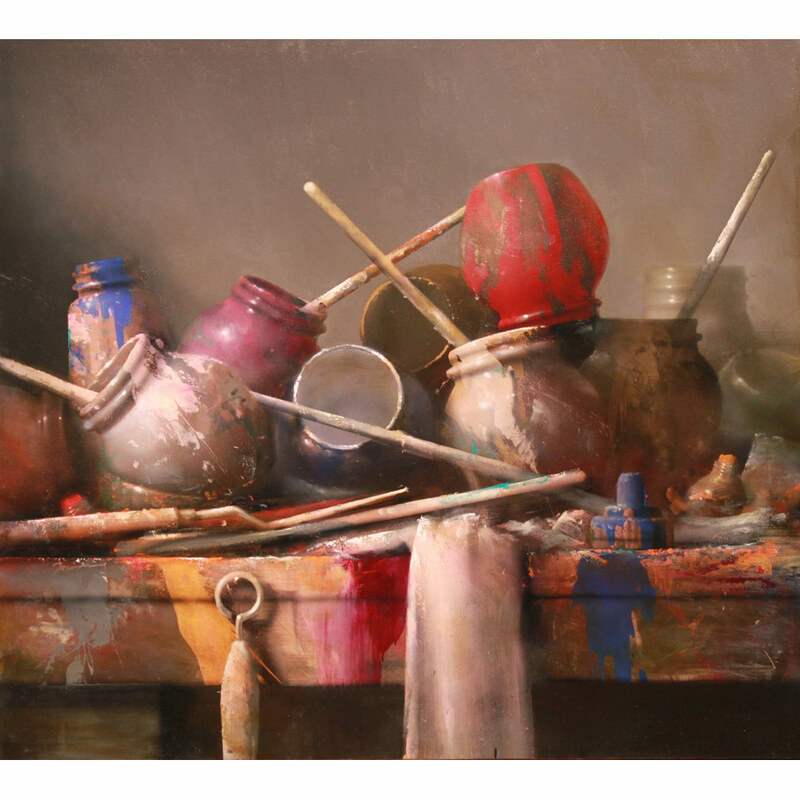 Recently he resigned a 17-year university faculty position to pursue his painting career full time. 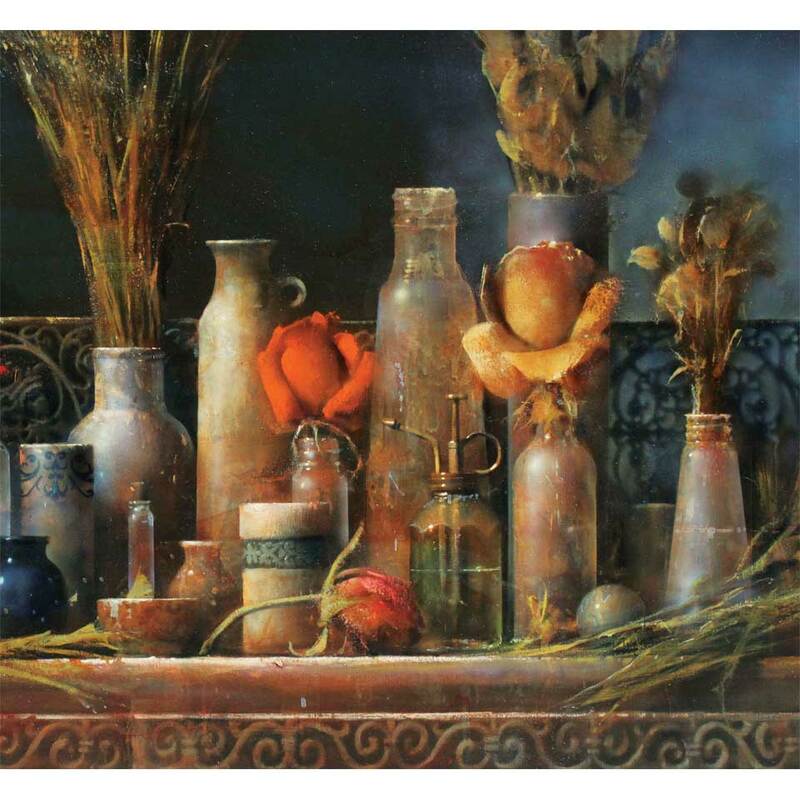 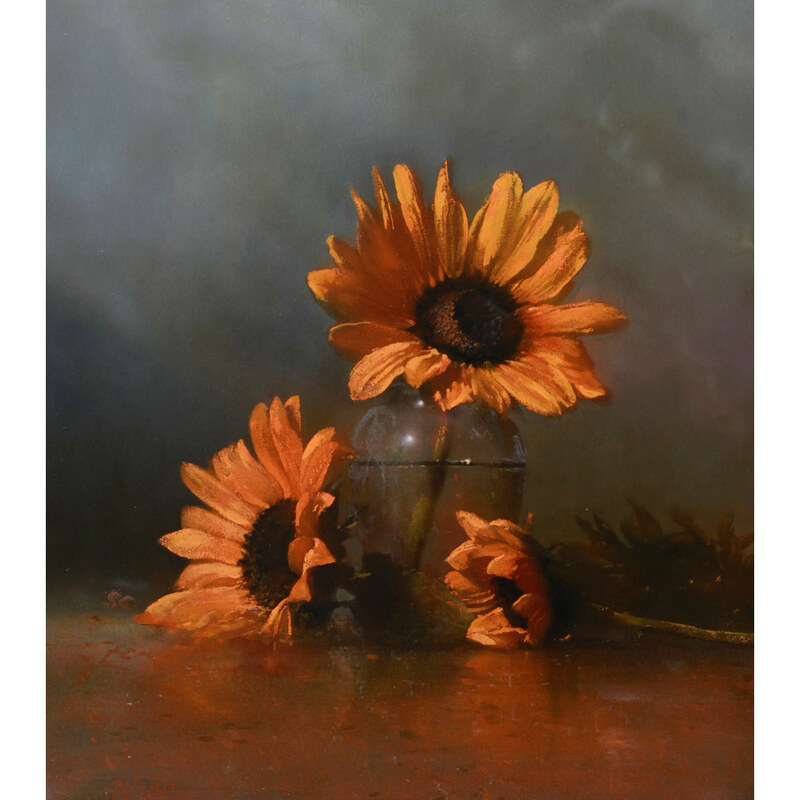 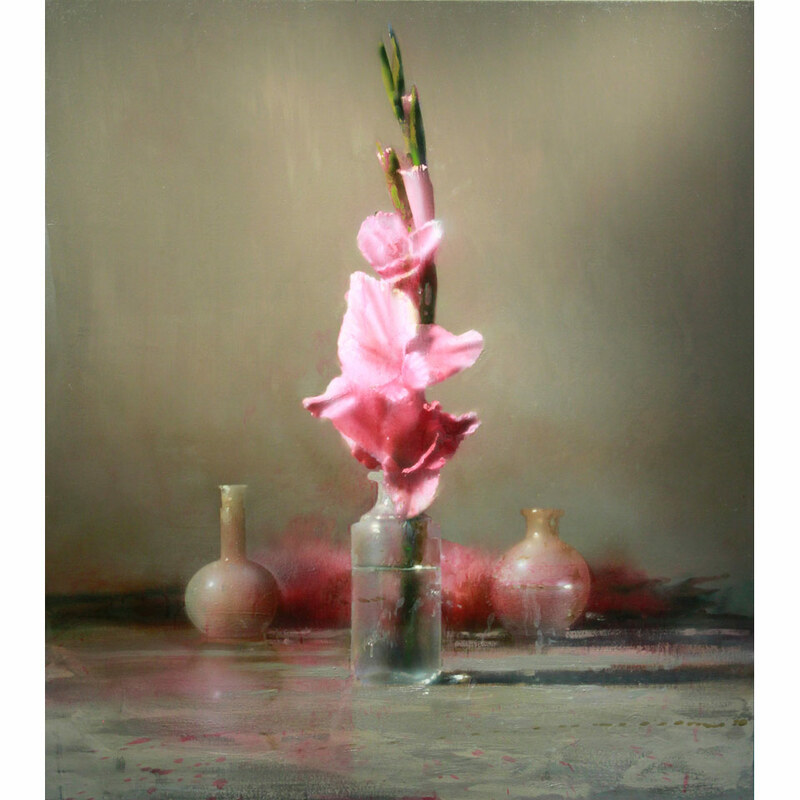 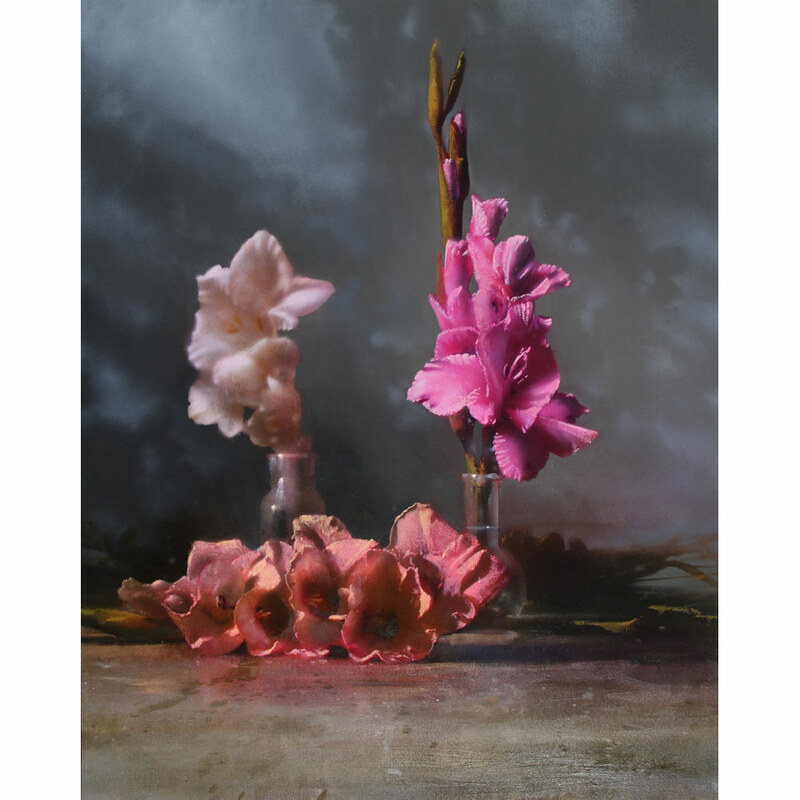 David has produced a sizable body of work, focusing most recently on a series of still life motif paintings. 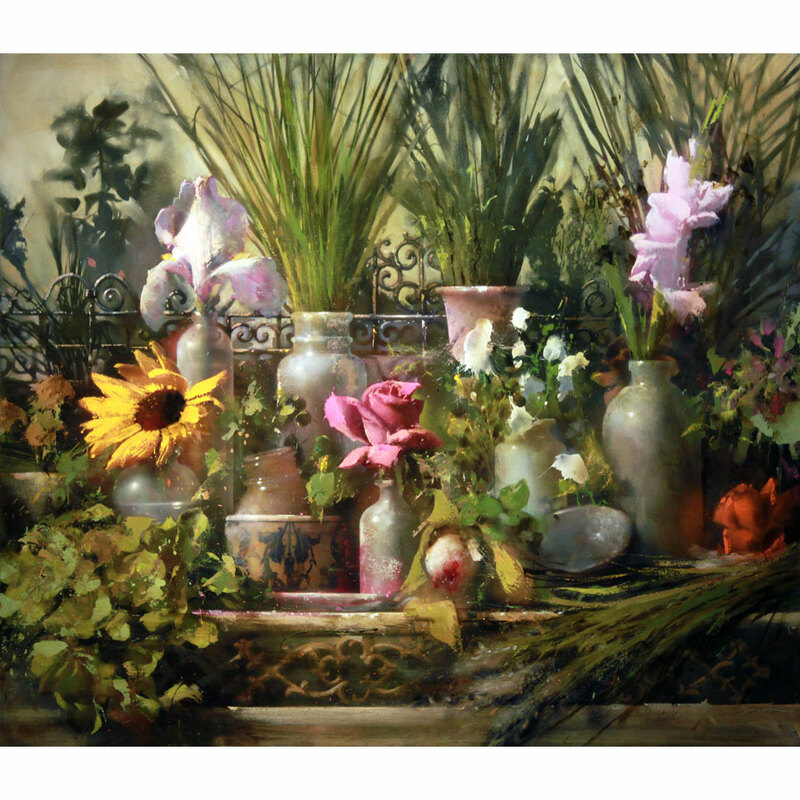 His work is in numerous public and private collections throughout the United States. 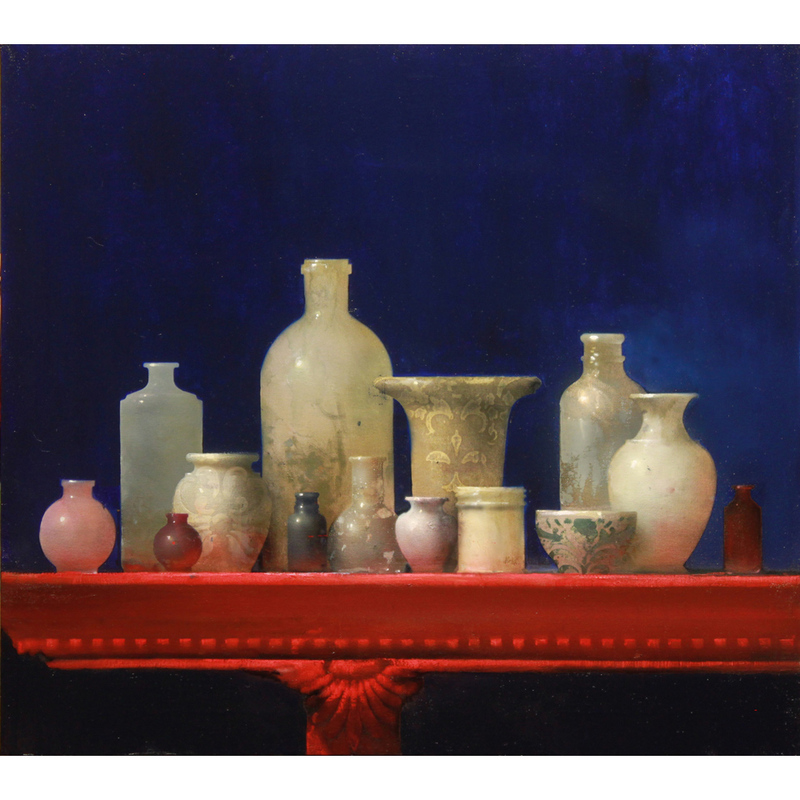 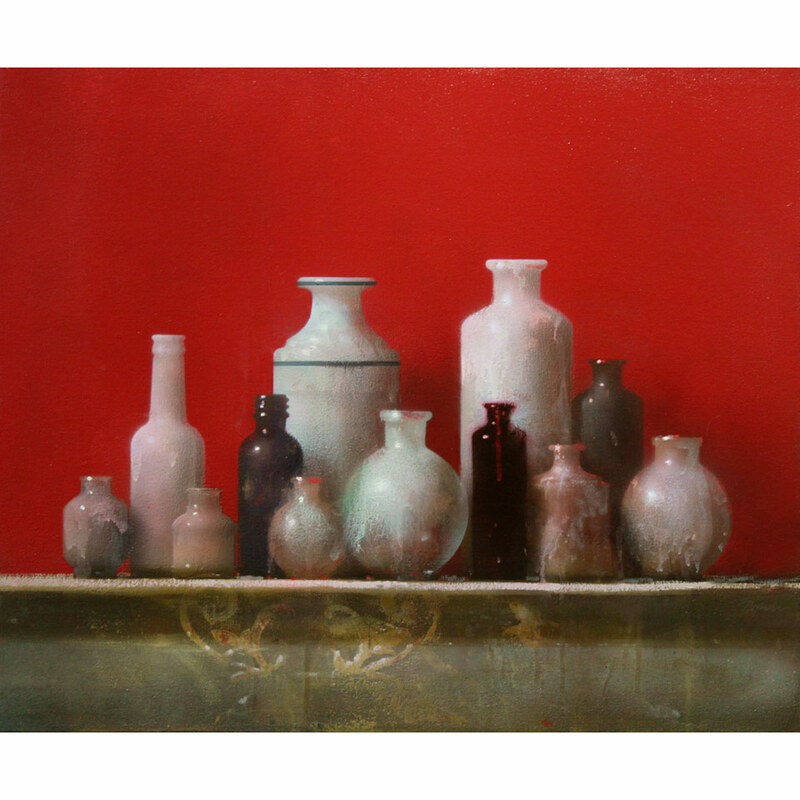 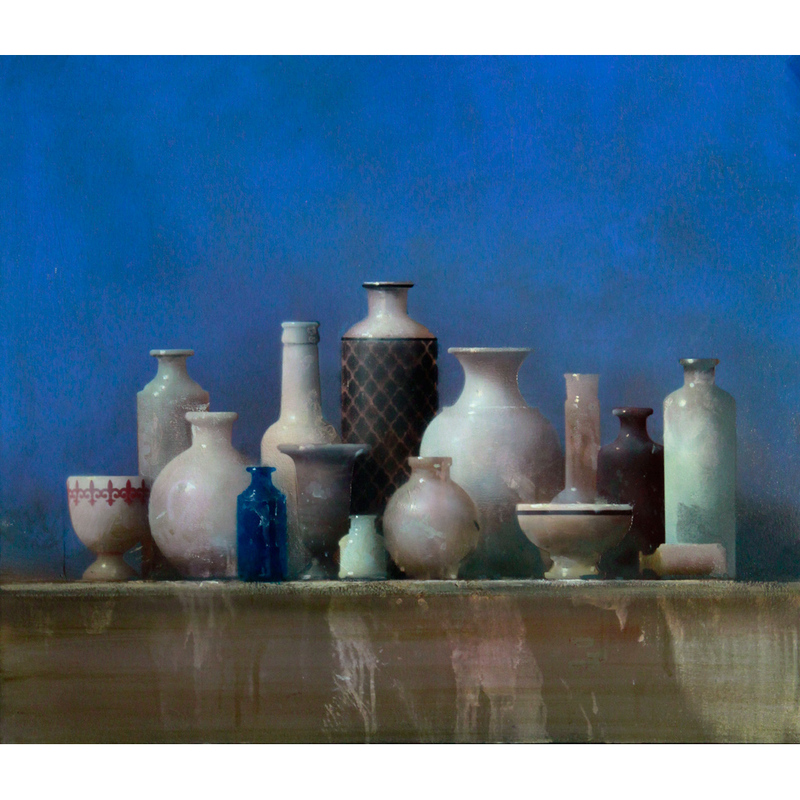 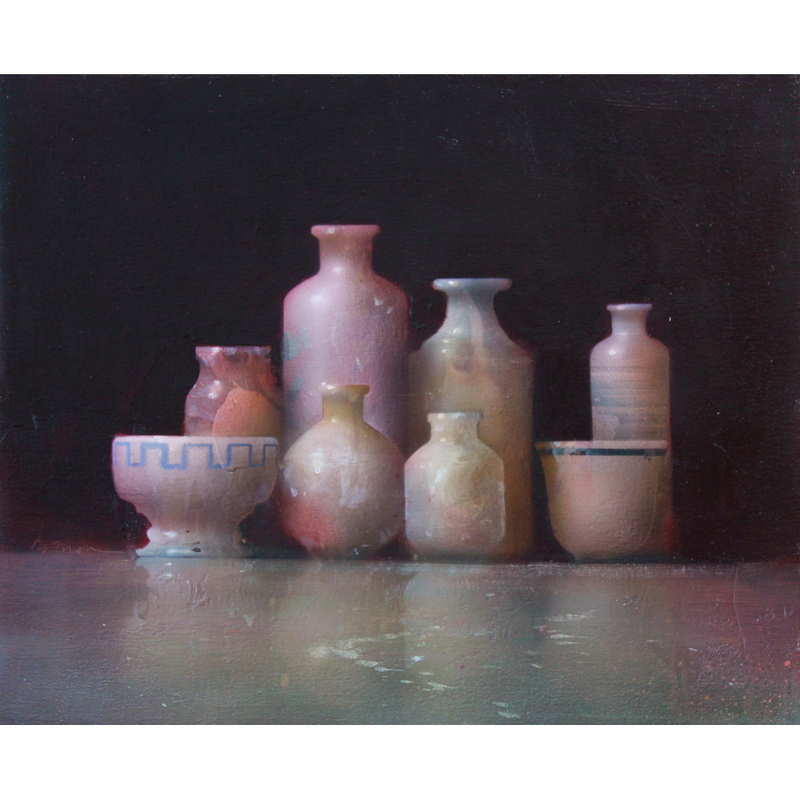 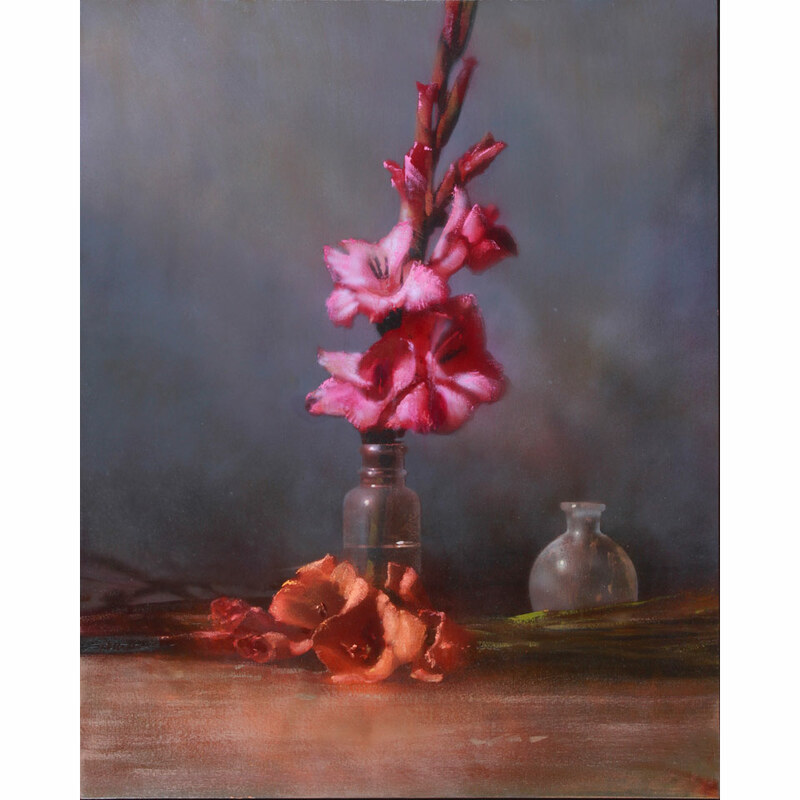 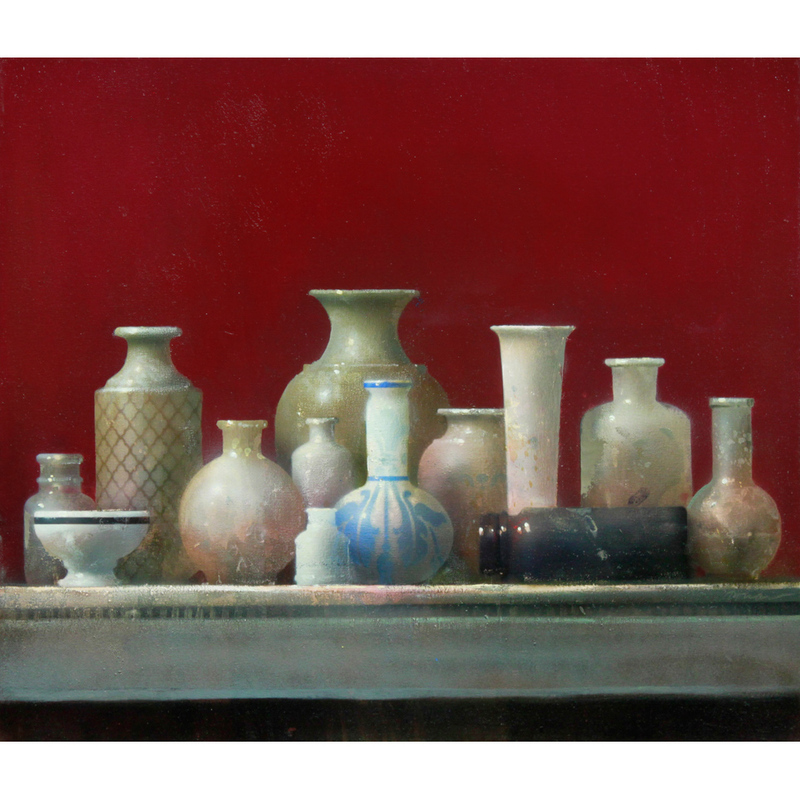 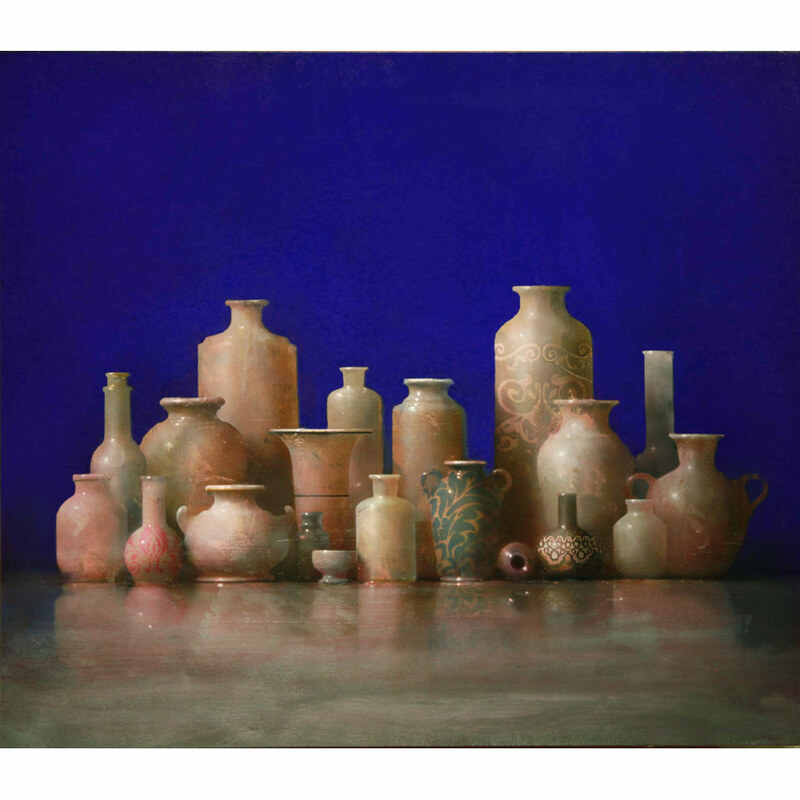 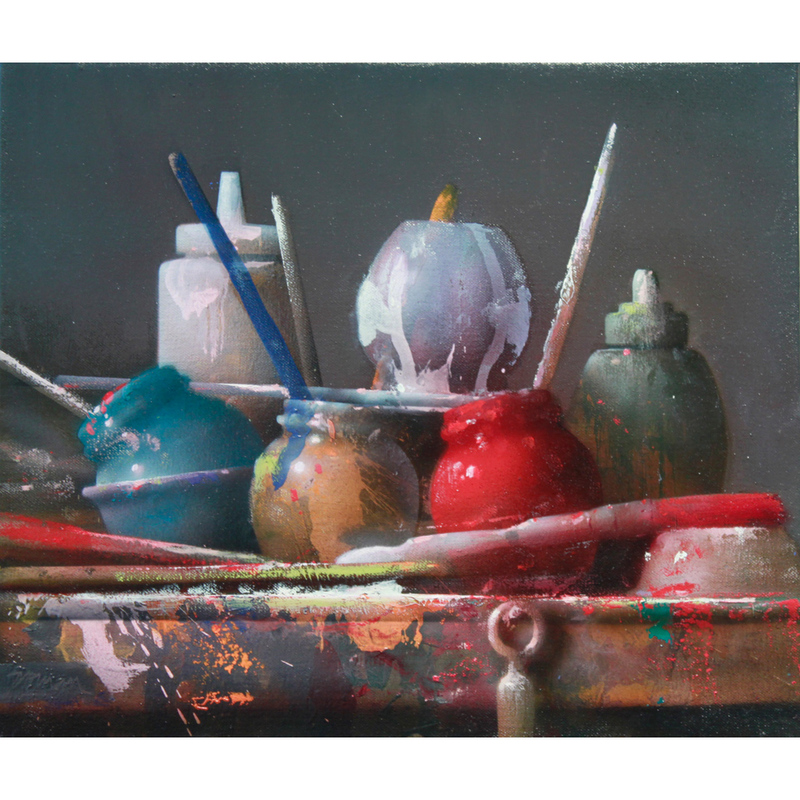 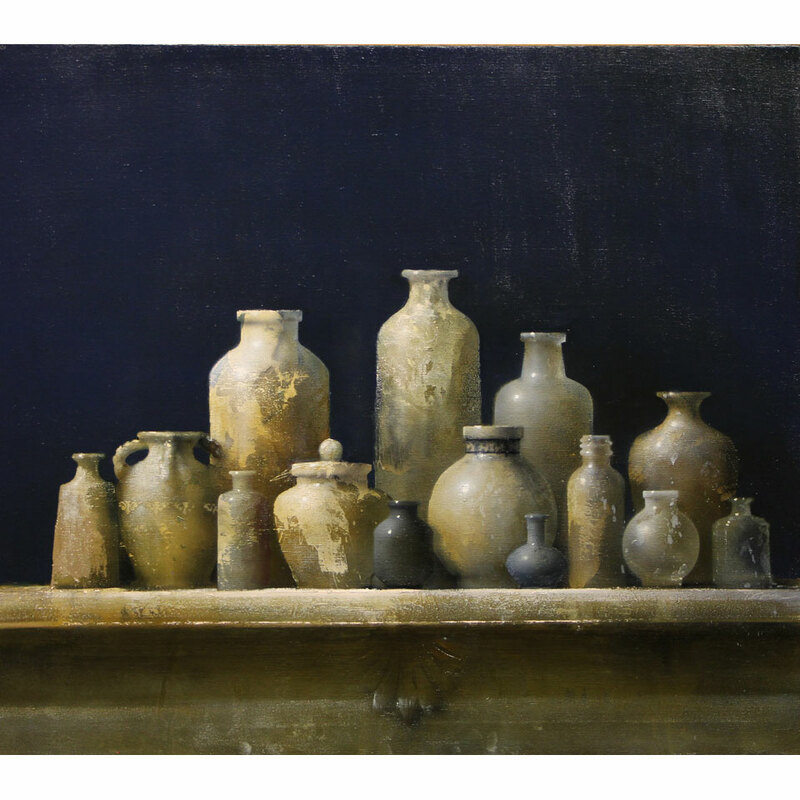 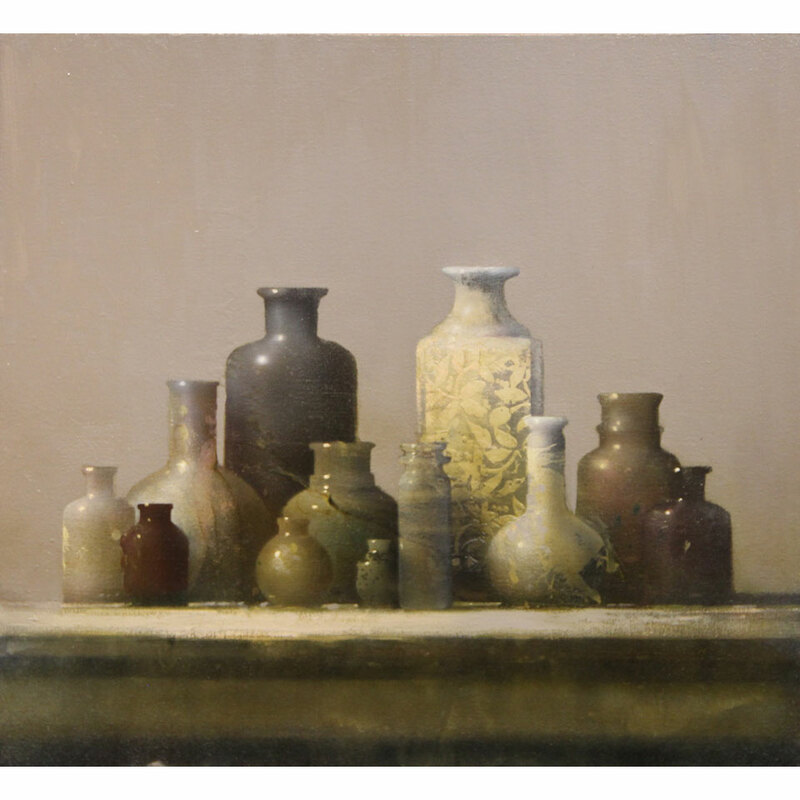 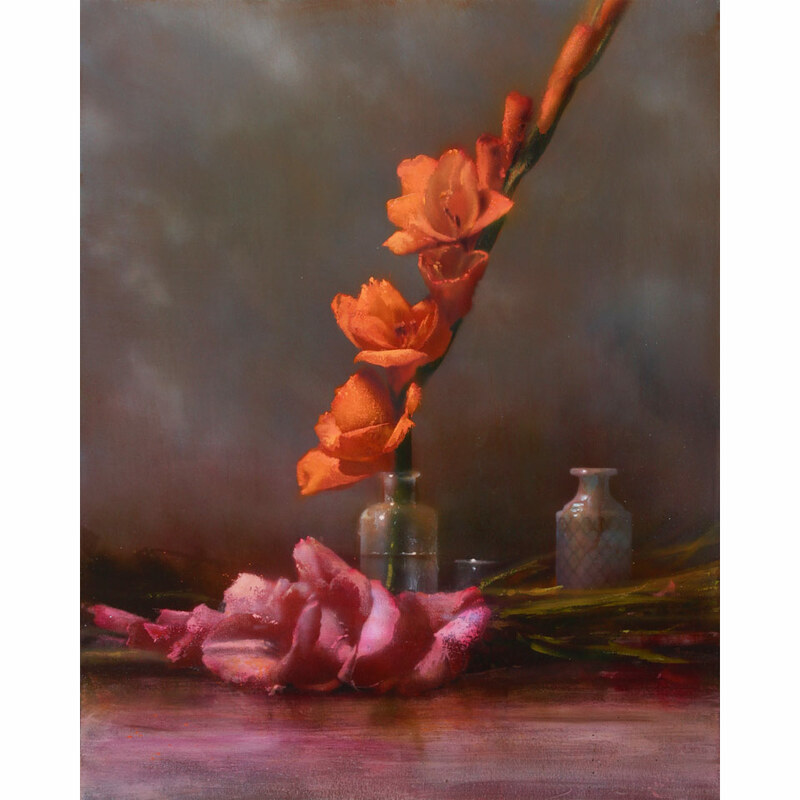 Throughout his career he has received purchase awards, prizes, best of show awards, and/or high placement in nearly every exhibition he has entered. 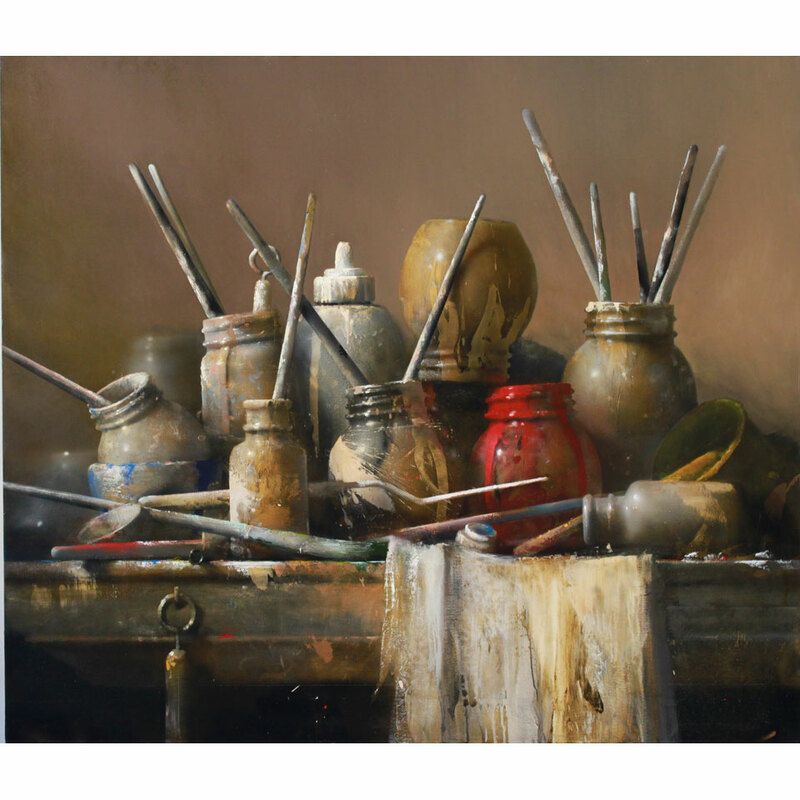 David has also won many academic and professional awards, and he has been exhibiting nationally for nearly 20 years. 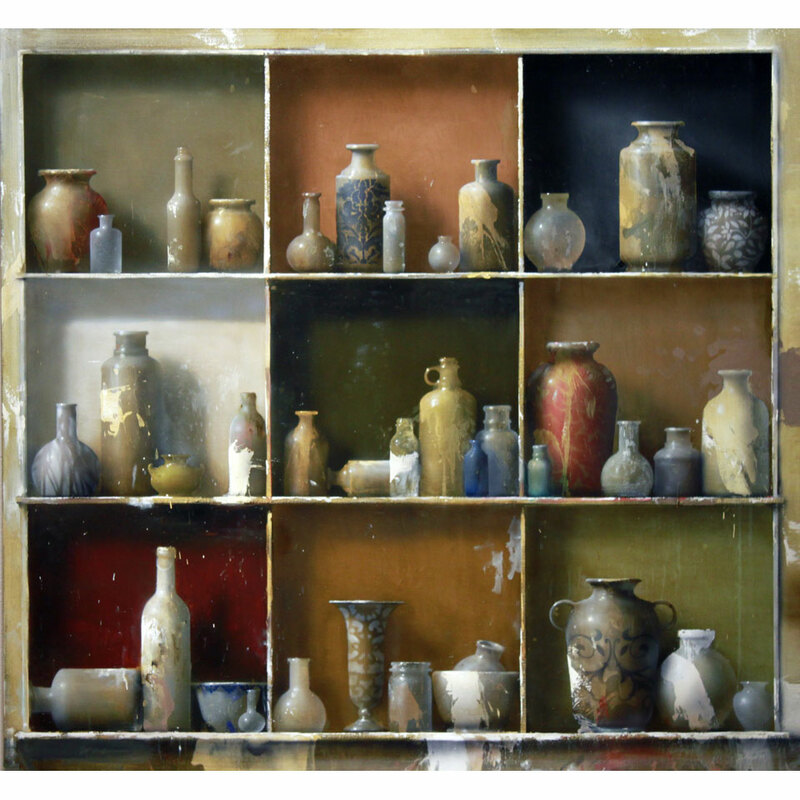 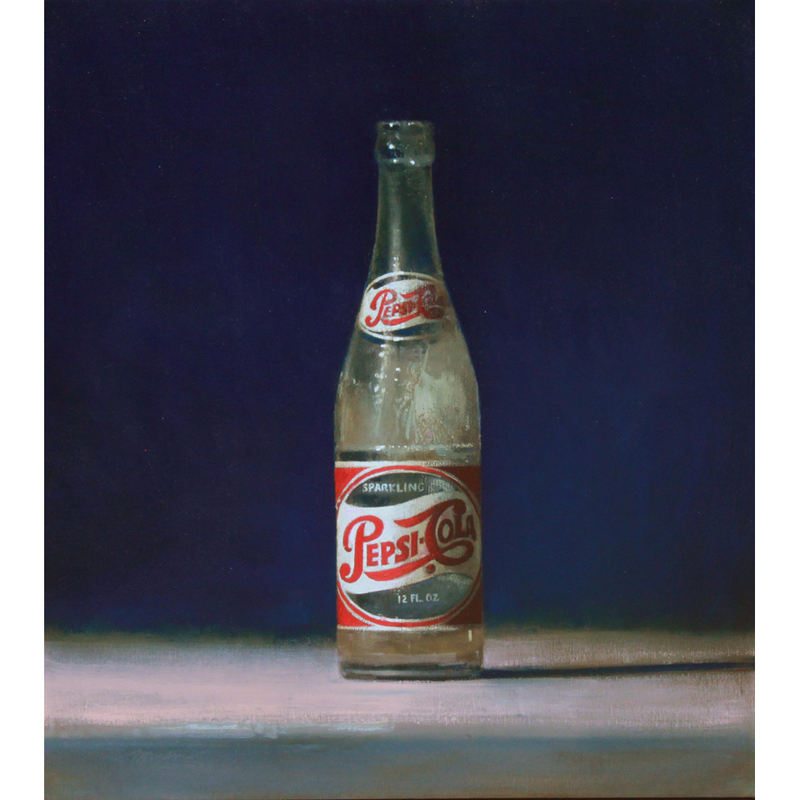 Remarkable things happen to commonplace objects in David’s paintings. 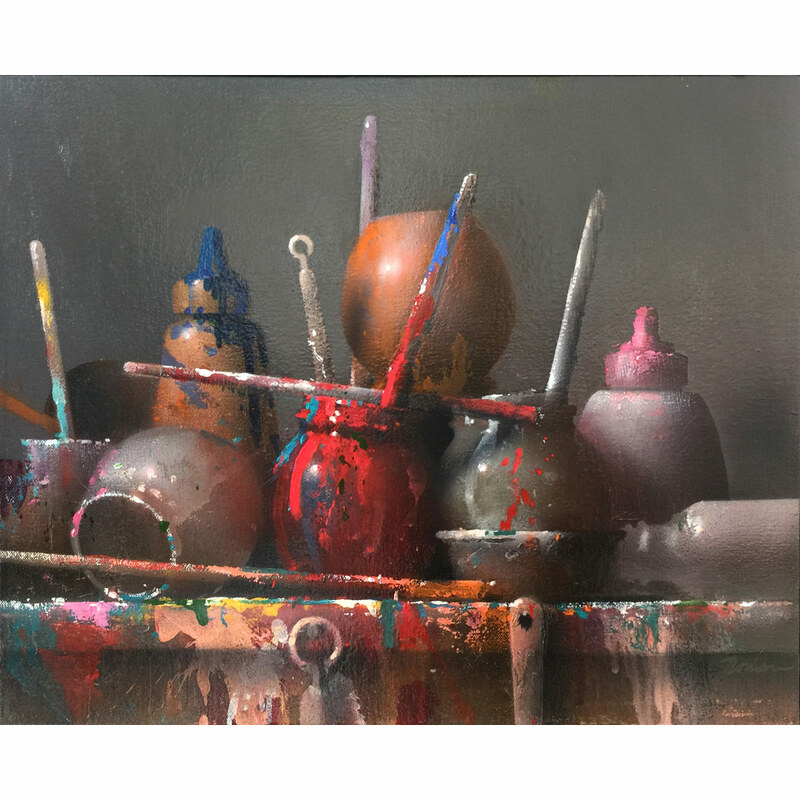 A can or jar, a flower, a paint brush- a palette as a sole subject or as elements in a complex composition take on a monumental quality through scale changes and central placement. 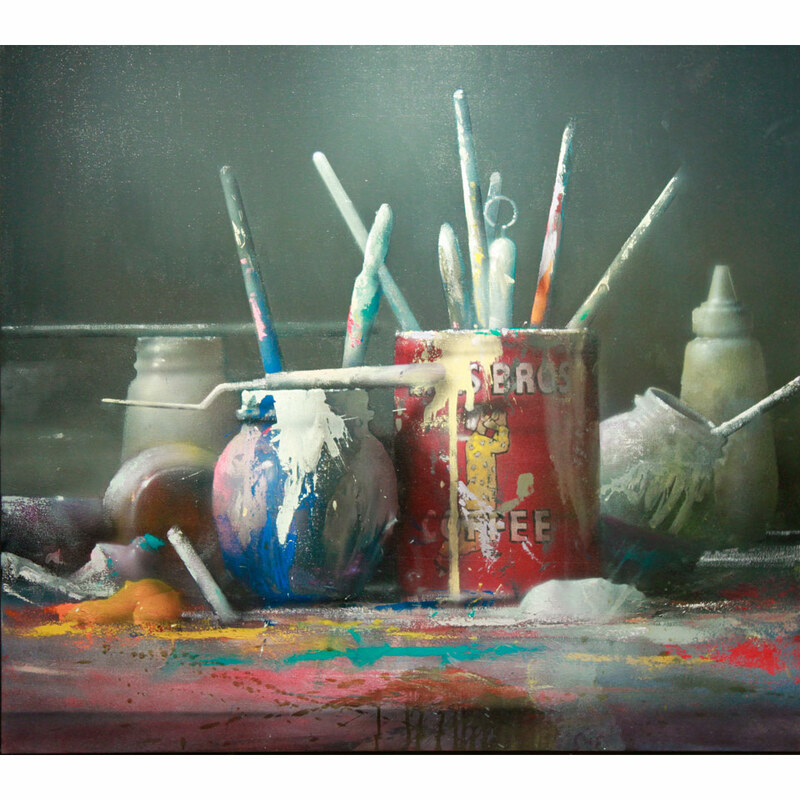 The objects painted assume a commanding presence through his assertive paint application. 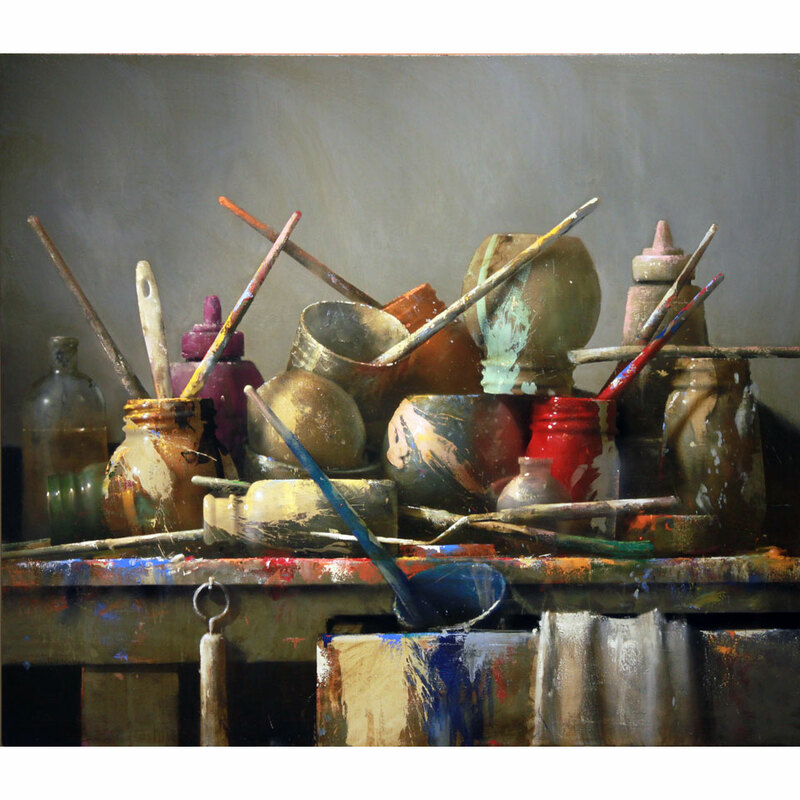 Immediacy and spontaneity are achieved not only with a brush, but also through the smear of a thumb, the wipe of a rag, and the “weight and speed” of a drip. 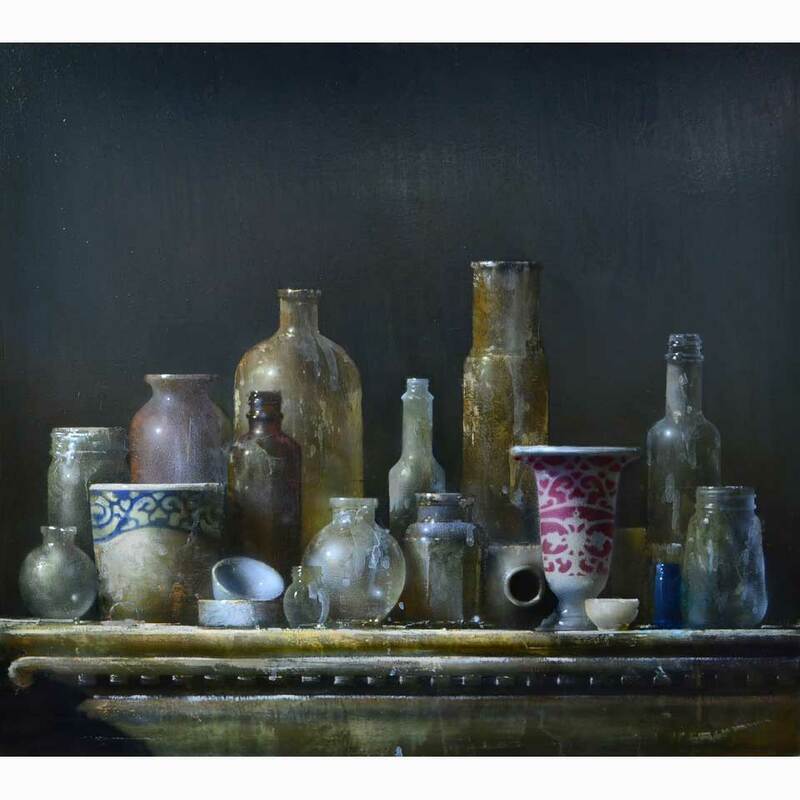 At a distance my paintings are depictions of familiar objects – cups and bottles, studio objects on a palette and, more recently, flowers- but the up-close view exposes the abstract juxtaposition and layering of paint, not the three-dimensional imagery. 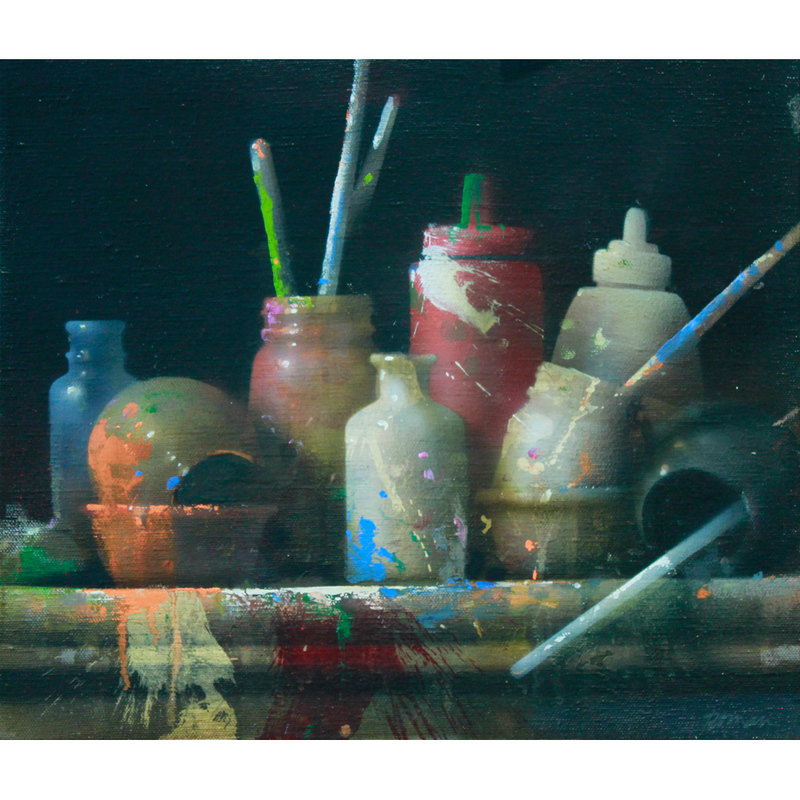 You can see the splotches, handprints, scratches – evidence of the way I put paint on canvas. 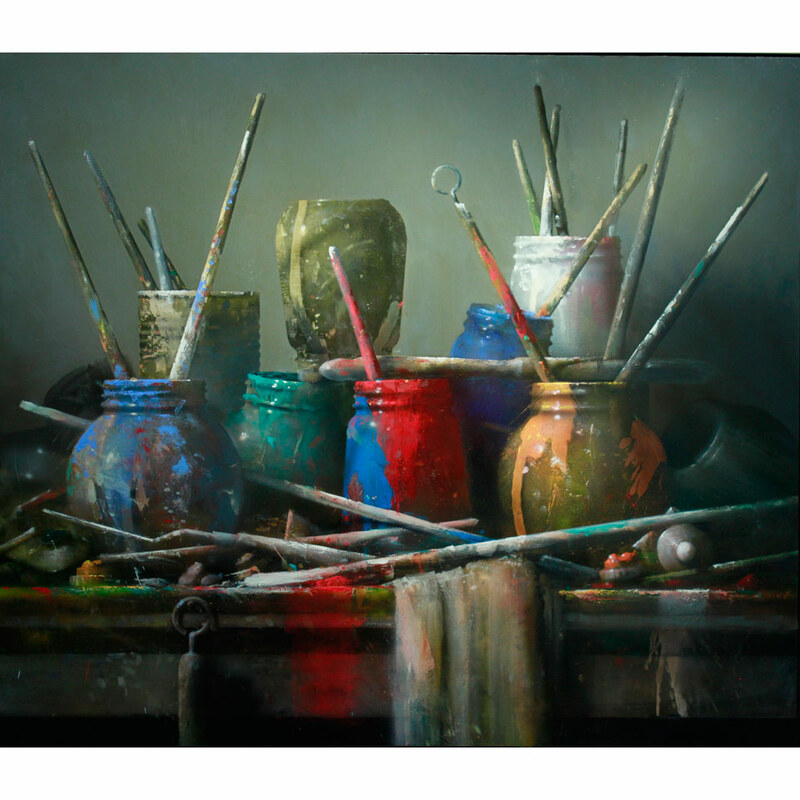 There is interaction between the two-dimensional and three-dimensional aspects of my paintings. 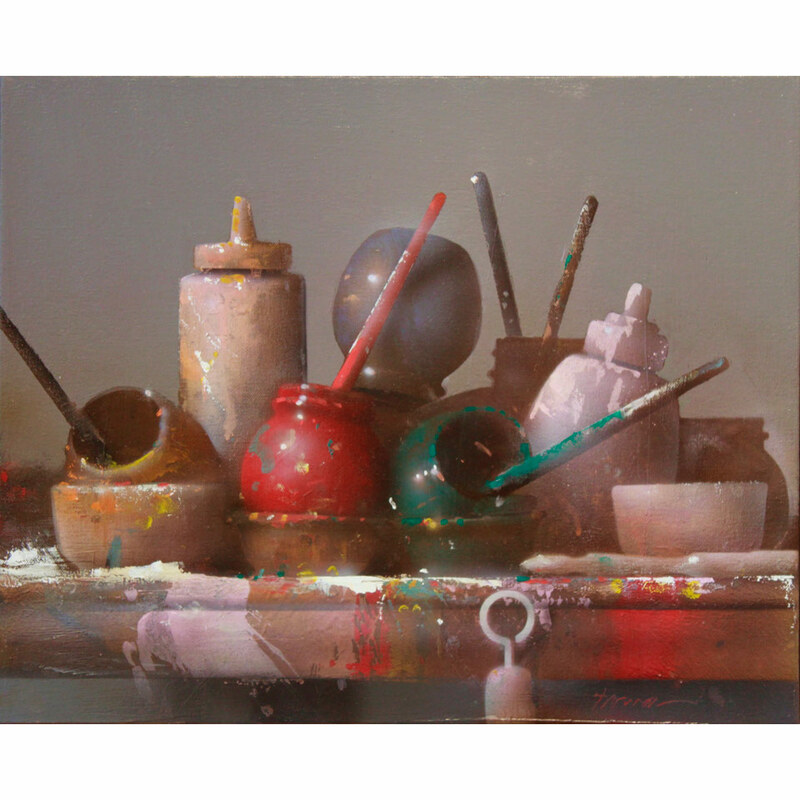 When there are objects within the abstraction I have a parameter against which to measure my technique. 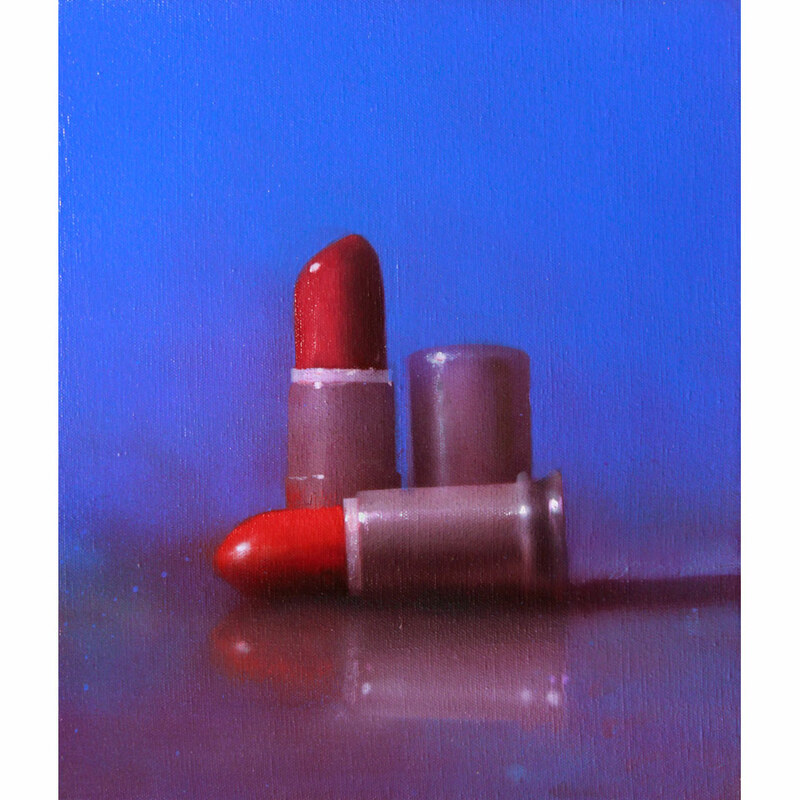 When I am painting a visual dialogue develops between the medium’s inherent qualities (i.e. 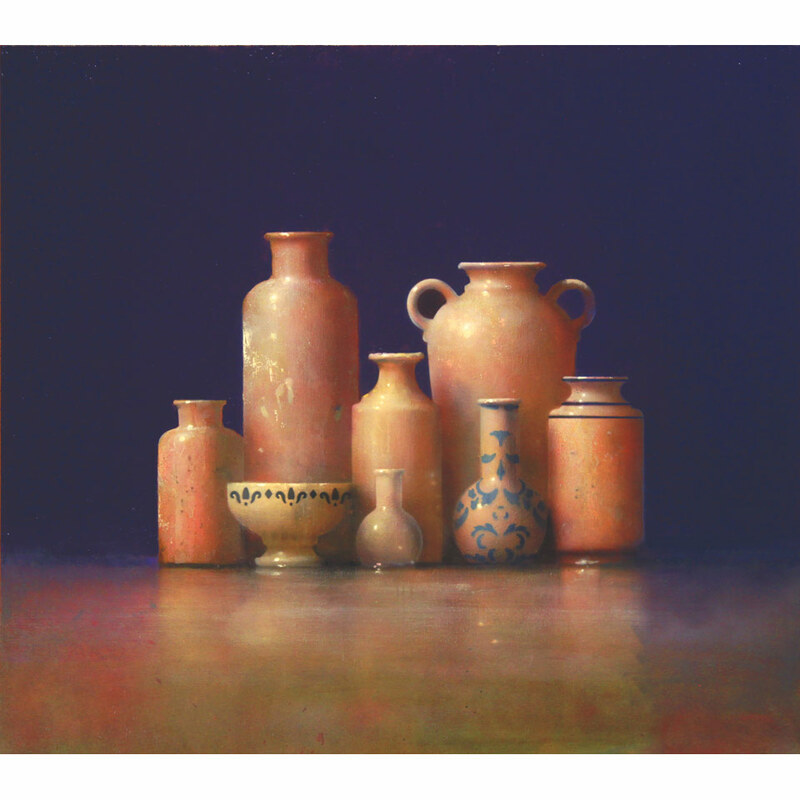 value, color, texture, fluidity, etc.) 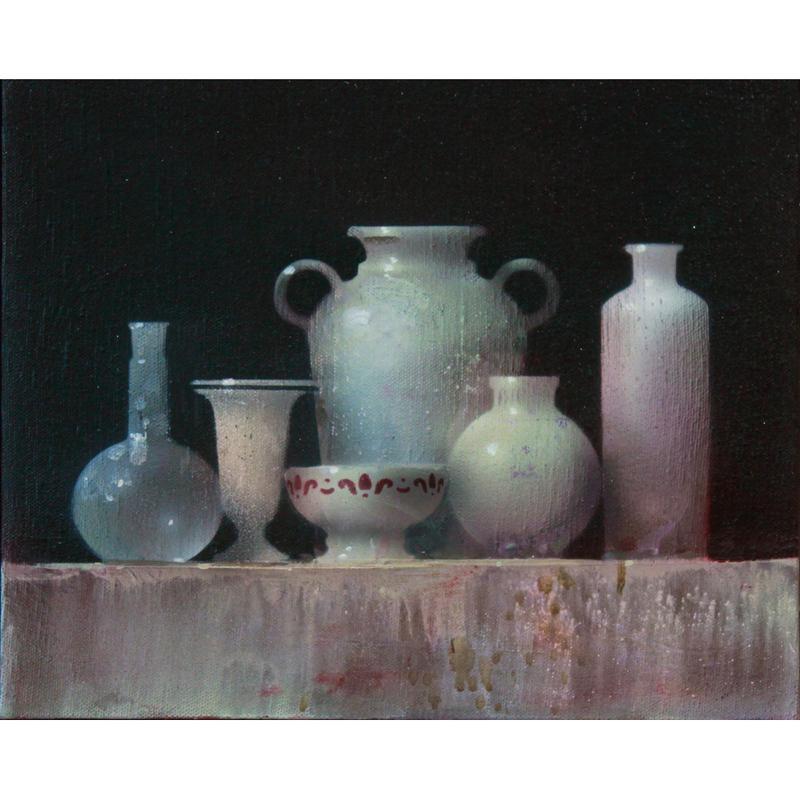 and the form I am trying to depict. 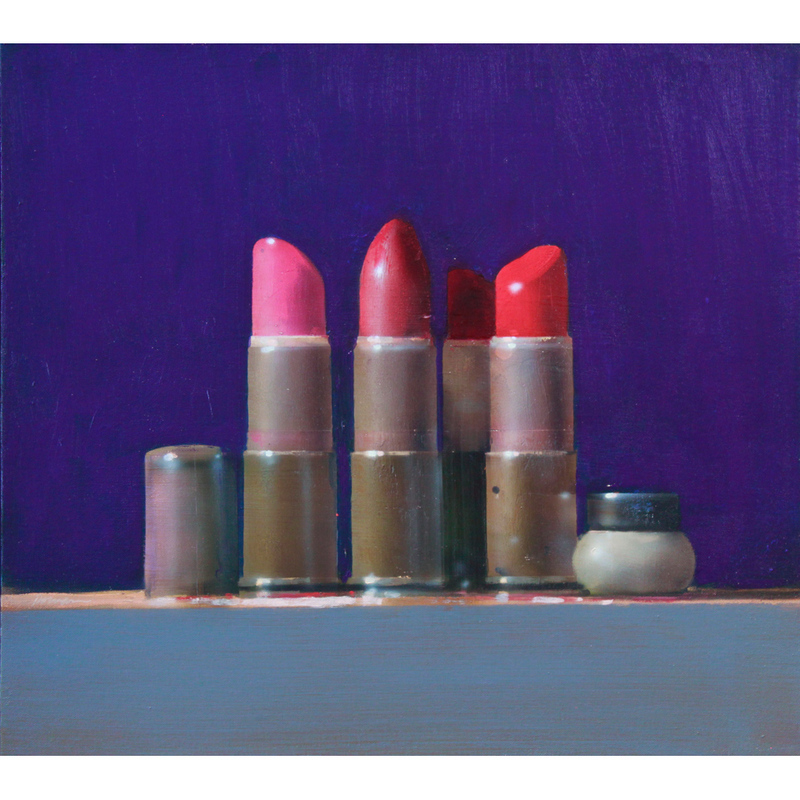 My paintings are a record of this visual dialogue. 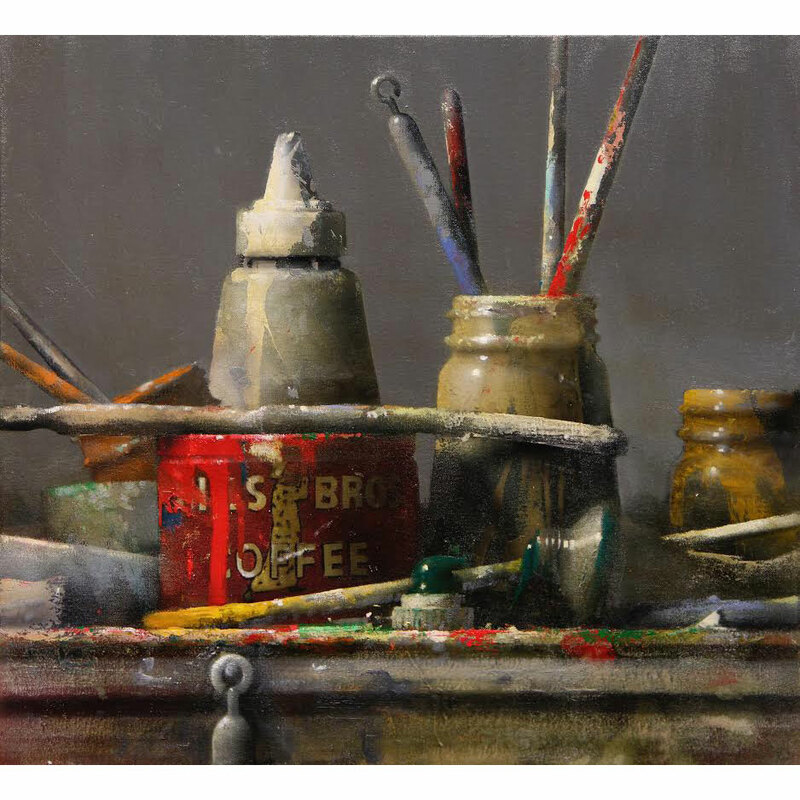 I do not begin a painting with a fixed idea of what the painting will look like. 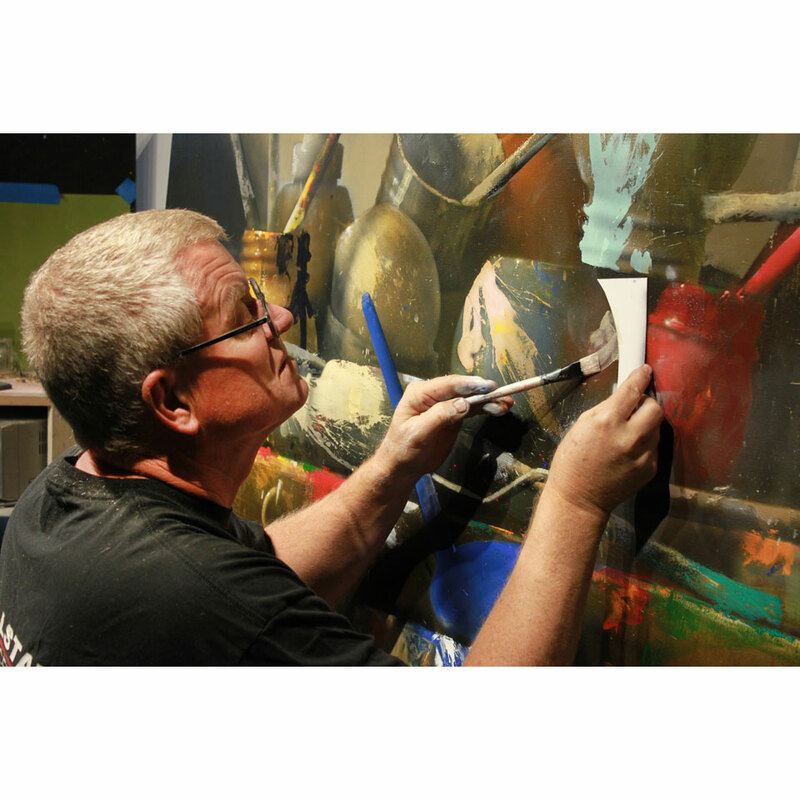 The methods and techniques, which I employ during the process of painting, determine the final results. 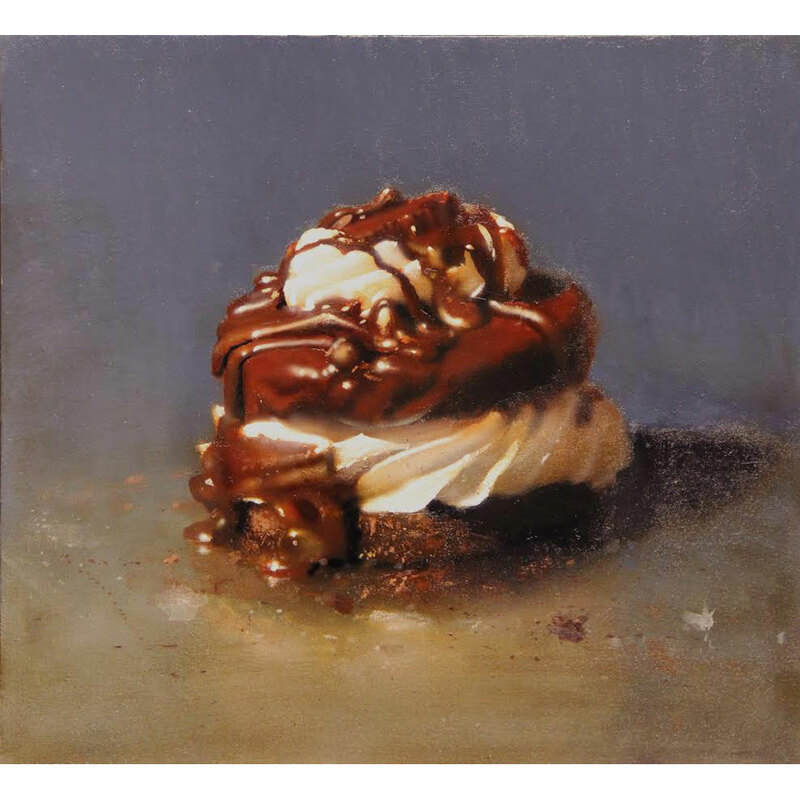 Sometimes I dominate this process with concepts and techniques, which are too familiar to me, and the result is always lifeless. 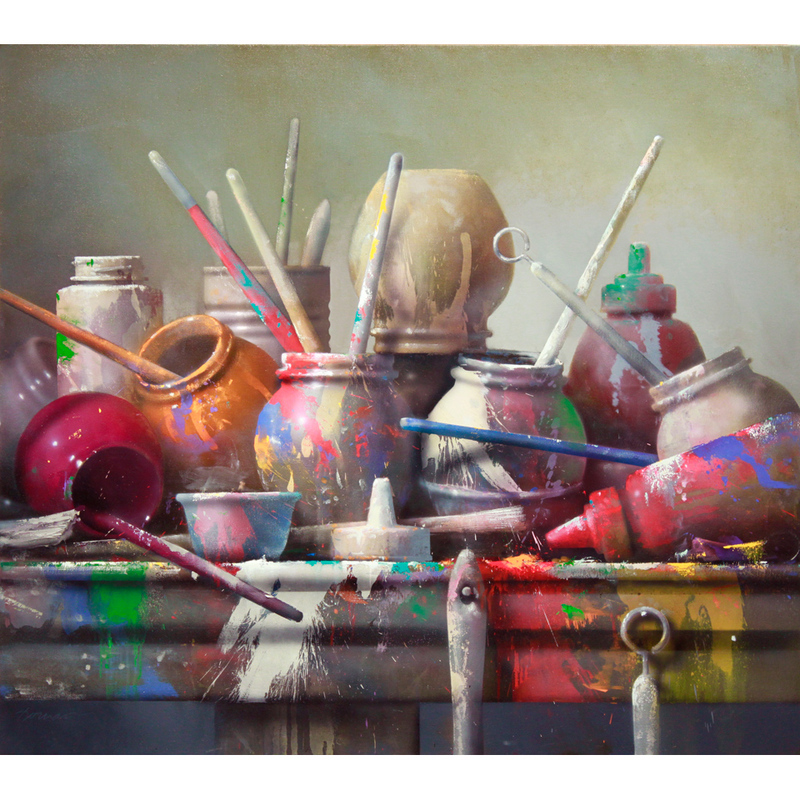 When this happens I will destroy or alter the image by employing haphazard, naive, or accidental paint applications. 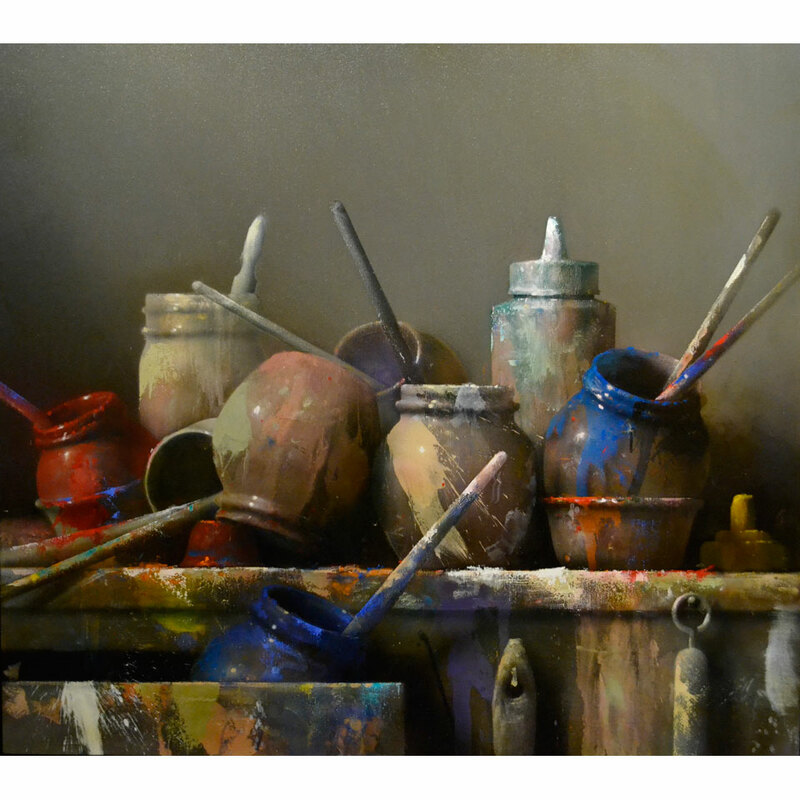 This will open the painting up, forcing me to react rather than to dictate. 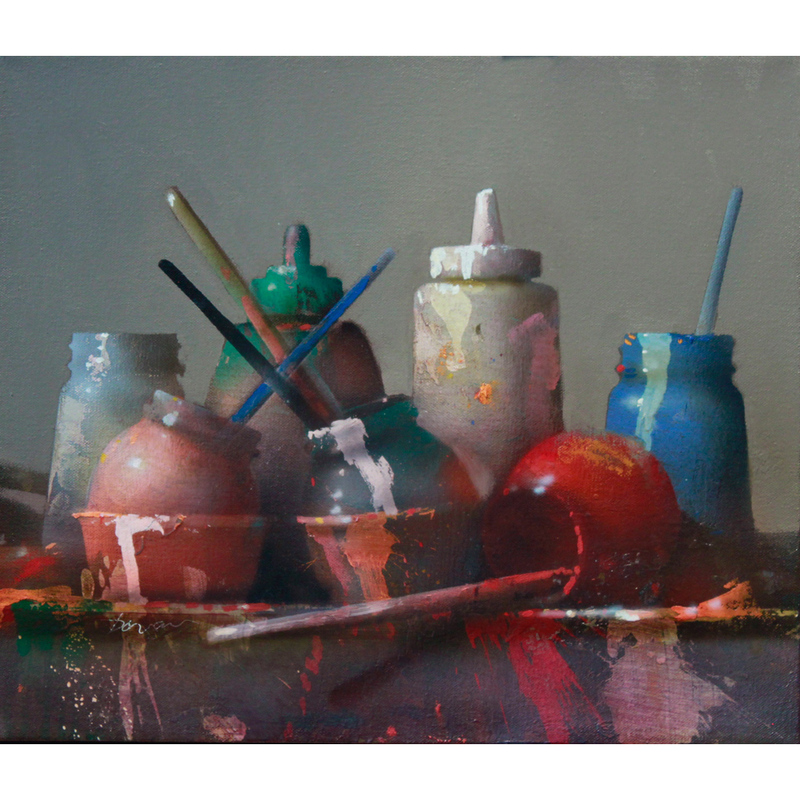 Painting is almost always more interesting to me when the process is pulling me as much as I am pushing it. 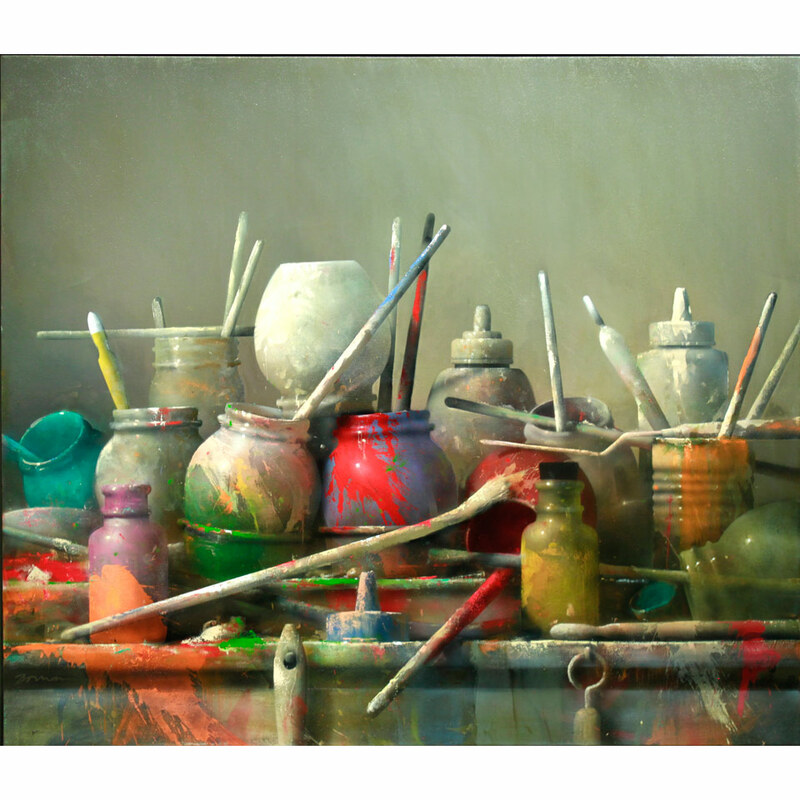 My most successful works seem to result when there is a meeting ground between total chaos and absolute control.